Fuel filters are considered as one of the most important elements in fuel filtration system, as quality of fuel affects on engine smooth operation and its life. Unfailing operation of fuel filters is critical when there is a possibility of low quality fuel. HOLA fuel filters consist of safety body, filtering element and inlet and exhaust pipes. Construction is sealed unit. Body covered by anticorrosion galvanic coating from both sides and painting on face side. Filtering element is made from special paper treated by phenolic resin. Cabin filters are designed to purify the air passing to vehicle cabin. Quality air filtration provides comfort and healthy conditions for drivers and passengers. In general, cabin filters consist of polyurethane body and special filter paper folded into corrugations for maximal filtering area. Filters production arranged according to advanced requirements of world automobile industry. Filtering element is made from the highest quality paper to prevent harmful parts entry into vehicle. Air filters are designed to purify the air passing from engine. Filtering quality affects on long-living of cylinder-piston parts of engine and mass flow meter. Some countries have more strict requirements to engine air filtering due to higher pollution, including Russia, where HOLA filters with improved technical characteristics are being supplied. 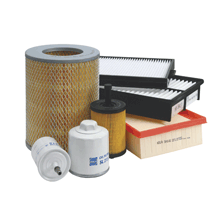 In general, air filters consist of polyurethane body and special filtering paper. Construction ensures high strength, easy installation and effective sealing of filtering element in plastic filter body.